I was also playing Atom Heart Mother this evening. Atom Heart Mother was one Pink Floyd album that never hit the spot for me. That one and most of Ummagumma. Six Circular Ruins tracks that fit together fantastically, although they're off two different albums- The Abyss Of Proof, Interior Distance, Standing In Violet Golds, Distant Assembly, Epiphenomena, and Subspace- Overdrive. Listen to those tracks in that sequence, and you have a terrific album in itself. Segue- Grey; a very low-key, pleasant album. I had to try it Joe, and yes Epiphenomena carries on very well from the Land Of The Blind tracks ... its the grainy noise base of the whole thing. And Subspace carries on the intensity, roundind it out nicely with a bit of rhythm. On Atom Heart Mother, I think Summer 68, If, and Fat Old Sun are excellent. Much as Granchester Meadows is on Ummagumma. I do love their more acoustic tracks from the early albums. Just bought this yesterday. Brilliant, captivating, immersive, spellbinding...I'm running out of adjectives here, but fully ingesting this great compilation of Rileymusic pieces recorded between 1993-98. Comprising massed vocal chorales, synths, loops, tablas, pianos, field recordings, lots of MIDI sound design and the like, if you want real "transcendental", neo-space-psych music, this is it. Packaged in a superb cardboard digi with real 60s/70s SF/West Coast pop art graphix & vibe, ambient purists as well as minimalist followers and electronic music devotees need to delve into this - it'll turn yer head. Oh, and I also heartily recommend a bunch of other reissued/remastered Riley works that were released over the past year or so, including some of his Organ treatises & rescued obscure soundtrack material, all top notch, vital, and necessary. - Philipp Weigl :: Fragmentary Proof - Big fan of Weigl, especially earlier things. The Stranger- The Stranger and Bleaklow; This is a Leyland Kirby side project, an older one, and far superior to his other stuff IMO. Both The Caretaker and the recent Leyland Kirby discs were far too repetitive for my taste. The Stranger is bleak and almost unbearably desolate, but so fascinating and strangely beautiful. The Circular Ruins- Degrees Of Separation; always enjoyable and absorbing. One of those discs that I always come back to every month or so. Pleased to hear The Ruins are standing the test of time, Joe. Thanks. Hessien- Home Is Where The Ghost Is; Very sparse acoustic ambience with lots of guitar, bass, and echo. A very crisp, dry sound... nice relaxing music to wake up to. Szymon Kaliski- Out Of Forgetting; treated piano, drones and fuzz. Drums Off Chaos & Jens Uwe Beyer - S/T. Brilliant tribal Ambient from Jaki Liebezeit and friends. Peaking Lights - 936. Fantastic Psychedelic Dub. Stephen Palmer - I dream of Urs Amman. Black Swan- Black Swan In 8 Movements- Classical music samples that start with a decaying crackle, and descend into the great void of synth drone, never to return. Not nearly as scary as the reviews make it sound. I sink so deeply into this everytime I hear it... excellent! Thanks to those that posted about 36. I like!! 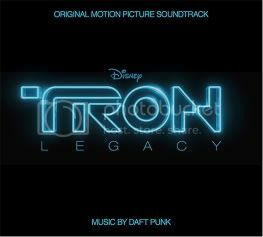 I cannot stop listening to Daft Punk's soundtrack to Tron: Legacy. It's a great amalgam of cinematic orchestral music with electronics. The main theme has me going nuts as I want to hear it over and over. Perfect driving music...dramatic (for the most part) with thunderous drums, cool synth work, and soaring strings. Makes me want to see the movie again and I've decided I will buy it when it comes out...sometimes, the music makes the movie that much better, I guess. Sleepy - I have that same mix, excellent music! A lot of good mixes over at A Strangely Isolated Place. The Dark Water Hymnal - Collapsing the Structure - a little bit Avett Bros, a little bit Mumford & sons, good stuff. Tame Impala - Innerspeaker - awesome Beatles-esque, psychedelic pop.